There are a number of excellent resources, both online and in print, which describe, in detail, the workings of the immune system in the human body (for example, this online textbook). Since it is not my intention to go through it all in this post, I would like merely to draw attention to, and remind readers of, the manner in which the adaptive immune system functions and how this relates to vaccines. The adaptive immune system functions via the process of immunological memory. Immunological memory occurs when immune system activity generates a set of cells called “memory cells”. Memory cells are long-lived and allow the immune system to more rapidly recognize and attack invading pathogens. Pathogens are identified via the recognition of specific antigens, and the detection of non-self or missing-self antigens tells other immune cells to seek out and track down the pathogens associated with the antigens detected. This typically means that subsequent infections by pathogens of a human body that has adapted appropriately are weaker, at worst, or even do not result in substantial sickness at all. Vaccination attempts to take advantage of this process by presenting the antigens of infectious diseases, usually divorced from wild-type pathogens by killing or otherwise inactivating them or by extracting antigen components, to the immune system. Vaccines prime the immune system to the potential threat of infectious agents, and when the real agents show up down the road, the primed immune system can usually detect and destroy them before they can lead to clnical illness. For quite some time, humans have known that inoculating themselves with extract of smallpox from its victims could provide protection against full-on smallpox. A key advance, as credited to Edward Jenner, was substituting ‘variolation’ (inoculation via smallpox) with ‘vaccination’ (using the vaccinia virus, also called cowpox). It turned out that injections of cowpox produced a similar immune response against smallpox as direct smallpox inoculation, but with less risk (cowpox being a great deal less virulent in humans than smallpox). As relates to the theme of this week, it should be noted that, even at the outset of vaccination (indeed, even before Jenner’s work), that there were those who actively worked against furthering the practice – that is to say, as long as there has been vaccines, there has been an anti-vaccine movement. 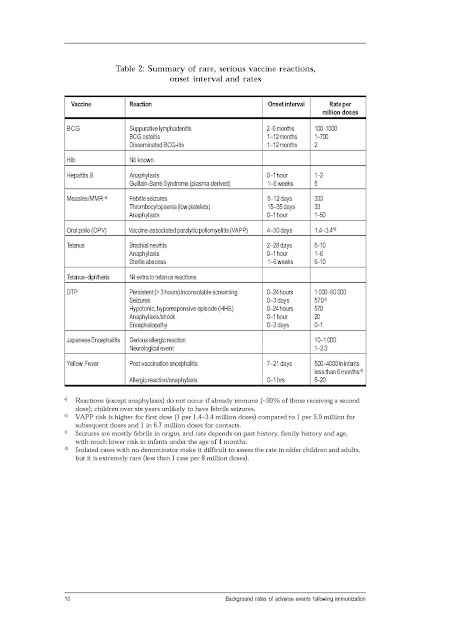 Vaccines typically have three components: immunogens (the specific components – attenuated or killed micro-organisms or even just broken down antigens) identifying the pathogens which the vaccines will grant immunity to; adjuvants, which boost immune system response to the vaccination while allowing minimization of the particular immunogen in the contents of the vaccine; and preservatives, whose purpose is to protect vaccines from contamination from other microbes (bacteria, fungi, etc.). Vaccines are typically delivered via subcutaneous injection, although some are delivered orally (certain varieties of polio vaccine, for example). There even exists a nasal spray version of influenza vaccine, called FluMist. The infectious organisms that vaccines help the immune system combat are, like all organisms, subject to gene variation. In some cases, these variations allow pathogens to evade previously-established defences and escape early detection by the immune system. Influenza is a case in point: a new vaccine is required every influenza season and is a not-always-perfect attempt to match the major strains circulating. Another example is HIV. While immunity to some diseases, whether granted by infection or immunization, can be lifelong, for other diseases immunity can wane over time, whether due to age or to declining exposure to the antigen. For example, pertussis immunity, given that wild pertussis is no longer in widespread circulation, tends to last for 4-20 years, whether one was immunized or infected. Waning immunity can sometimes be made up for via boosters. In some cases, immune response is not 100% effective. For example, measles vaccines tend to produce immunity in only 85-95% of vaccinated individuals on the first vaccination, requiring a follow-up shot to catch the rest. However, whether for measles or other diseases, there is a non-trivial number of people who do not achieve immunity from vaccination, even when receiving the full recommended complement of shots. 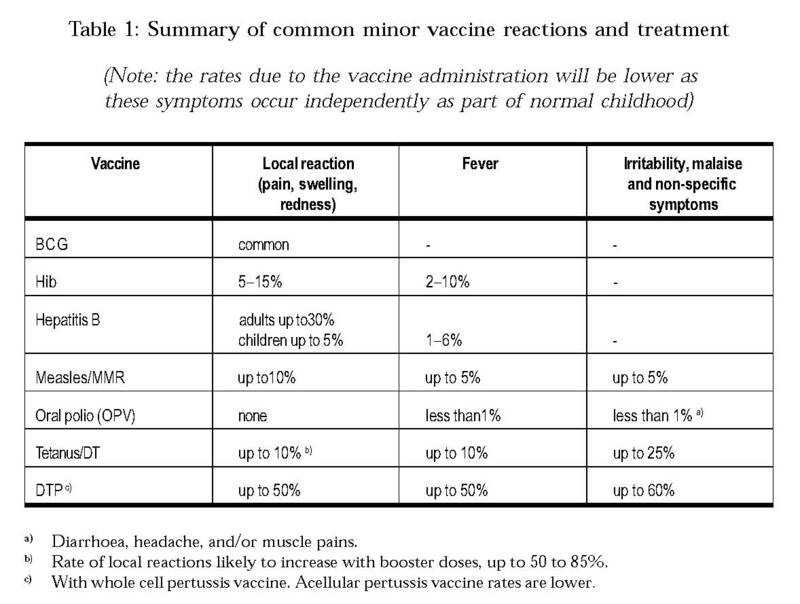 In Canada, any adverse effect from vaccines is required to be reported to the Public Health Agency of Canada; in the United States, vaccine adverse effects are reported at VAERS, the Vaccine Adverse Effects Reporting System. While the United States has a national vaccine injury compensation programme, Canada unfortunately does not appear to have an equivalent. The NVICP operates as a no-fault compensation system, thus ensuring people who have suffered from adverse effects from this particular medical intervention are compensated by everyone else while also protecting the supply of vaccines. For various reasons, many individuals are either unwilling or unable to get vaccinated. The CDC has a comprehensive list of medical reasons why people should not get vaccinated or should consult with their doctor before getting vaccinated, on a case-by-case basis for each vaccine offered in the US. The CDC also publishes a guide to vaccine contraindications for medical service providers. One of the most common reasons not to get a vaccine is allergies. Influenza vaccine viruses are grown in chicken eggs, and anyone allergic to chicken eggs simply cannot get vaccinated for influenza. Other common allergies that preclude many vaccines include allergies to yeast or to latex. Although this series of blog posts is meant to counter the effects of the anti-vaccine movement, it is, at least in my estimation, possible to object to vaccination (either in general or certain vaccines in particular) without being anti-vaccine. I will expound on the distinction shortly. As noted above, the risks of adverse effects are very low, but real all the same. These risks may lead people to avoid getting themselves or their children vaccinated. Some religious groups forbid the use of vaccinations by their members. I am not aware of which religious groups, and was not able to turn up a list of larger religious communities forbidding vaccination. So anyone who finds specific examples of religious communities that forbid vaccination as a matter of doctrine will receive my hearty thanks. A case can also be made to reject mass vaccination based on libertarian thought, whereby mandatory vaccination schemes are an infringement of their personal liberties and/or constitute an unjust ‘nanny state’ intervention. This is by no means a universally-held (or even commonly-held) position among libertarians. As I noted just a few paragraphs ago, I conclude there is a distinction between non-vaccination and anti-vaccination. There is, I think, a clear conceptual difference between simply deciding not to vaccinate one’s self or one’s children, and acting to discourage other people from vaccinating themselves or their children. In short, anti-vaccination is about activism. The policy endpoints of the anti-vaccine movement – inasmuch as its adherents consciously or coherently espouse policy endpoints – are the reduction or even abolishment of mandatory vaccination programmes and the rejection of the ethical and scientific justifications for mass vaccination. As we shall soon see, however, this activism leads to a number of unpleasant consequences. One thing I would like to point out is that although reactions to vaccines are "supposed" to be reported, it rarely happens. First of all, many doctors are reluctant to admit that a reaction was caused by a vaccine (because you can't necessarily "prove" it). I have read many accounts of parents who are quite sure that a reaction was caused by a vaccine, but the doctor wouldn't admit it. Also, some parents do not know that they should report a reaction. Finally, there are many possible long-term effects of vaccines that will likely never be reported. A causal link does not prove a direct link, so there will also be some question about what has caused certain reactions. Welcome to the blog, Karen, and I'm glad you commented. First, let me say I hope you stick around for installments post-vaccine awareness week (my apologies if the HTML code I am attempting to use here does not work). I have been dedicated to posting on the subject this past week, but it is hardly my principal interest. - that reporting on adverse effects rarely happens? - that health care providers are reluctant to admit the occurence of an adverse reaction? - that health care providers talk down parents from reporting an adverse effect? I should not like to get into an extended conversation in the comments since of course I have only so much time to dedicate to this blog before I fail to meet other time commitments, but I should like to consider the difficulty that epidemiologists and policy-makers would have tracking potential long-term effects from vaccines. (1) A substantial increase in the availability and consumption of high-fat/high-sugar/high-sodium foods, with notable negative health effects. (2) A substantial increase in overall industrial and consumer pollution (with notable reversals, such as recent declines in sulphate aerosol emissions), with similar consequences. (3) A substantial increase in the sedentariness of lifestyles in the "old-money" post-industrial countries of the world. (4) A real, if not as substantial, increase in overall lifespans in rich countries, which entails an increase in the diseases of aging as a matter of course (such as dementias, cancers, heart disease, arthritis, and others). As you might imagine, it would not be easy to find a specific long-term health effect from vaccines with all those other factors in play, assuming of course that long-term effects are plausible (which one would calculate based on the ingredients in vaccines or the mechanical activity of vaccine injection) or probable.